Have you ever considered how much time most people spend indoors? If you guessed, you’d probably guess low, like 50% or 60%, but the truth is we pretty much spend about 90% of our time indoors. After all, we sleep indoors, we go to work or school indoors, and our meal time/free time is spent…you guessed it: indoors. It’s no wonder, then, that the best family vacations typically include outdoor activities. Our ancestors used to spend the majority of their time outdoors, and we’re wired to do the same, if needed. The thing is, today so much of life takes place indoors that it’s refreshing to actually spend time outdoors surrounded by nature and all it entails. Besides a general feeling of well-being while you’re outdoors breathing the air, listening to the sounds around you, and seeing visually interesting sights, the chance to do something out of the ordinary makes for great moments and eventual memories. 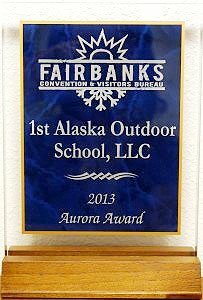 1st Alaska Outdoor School loves the outdoors, so much so that it’s part of the name! When you come to Alaska, a state rich in natural beauty, bring people you love with you to experience the breathtaking scenery. 1st Alaska Outdoor School offers guided trips into the Alaskan wilderness where you can enjoy hot springs, sledding, dog races and witnessing the world famous “Northern Lights” coloring the skies above. Alaska can be quite mesmerizing when it’s experienced outdoors, and having 1st Alaska Outdoor School Alaskan experts with you and your family can greatly enhance your adventure. Being outdoors is known to help reduce people’s symptoms of depression, anxiety and stress. It’s also a great place to get some exercise, which leads to weight loss and improved overall fitness. Too many people these days spend the majority of their time indoors staring at screens for hours at a time. Break that habit with a family trip to explore magnificent Alaska with help from 1st Alaska Outdoor School.